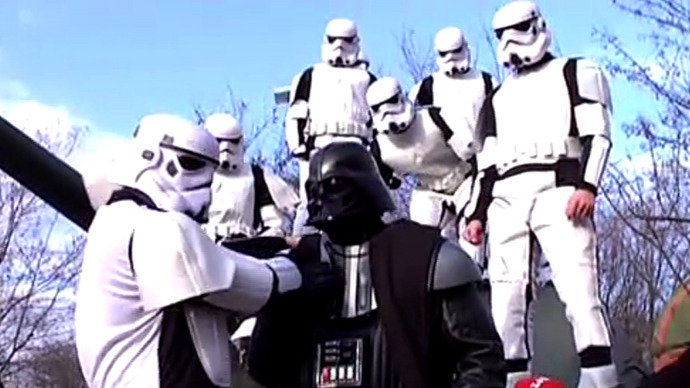 Imperial stormtroopers, led by Darth Vader, raided a shop in Odessa, Ukraine, on Saturday. The squad claims it was on a mission to find and destroy herbal smoking blends, prohibited in the country and allegedly sold in the store. The "special" operation was kick-started by a command given by a man dressed as the Dark Lord of the Sith, of Star Wars fame. The brigade of imperial stormtroopers then broke into an Odessa store, screaming “For the Emperor!” and asking the man inside “Where are the drugs?” They searched on and under the counter, ending up by collecting what they believed were prohibited substances into a saucepan. The operation culminated in stormtroopers setting the saucepan’s contents on fire and also in throwing a smoke flare into the shop. The shopkeeper, who denies he was selling anything prohibited, called police, but the costumed activists managed to disappear before they came. Still the leader of the group had time to speak to Ukrainian journalists. It was Emperor Palpatine’s order “to mercilessly and irreversibly cut the knot of drug dealing: to destroy the shops selling smoking blends and other powders. Those guilty of poisoning the nation should be brought to strict account before the Empire,” said Darth Vader to Dumskaya.net news website. Star Wars-related paraphernalia are used by the Internet Party of Ukraine, which claims Darth Vader is its deputy head. 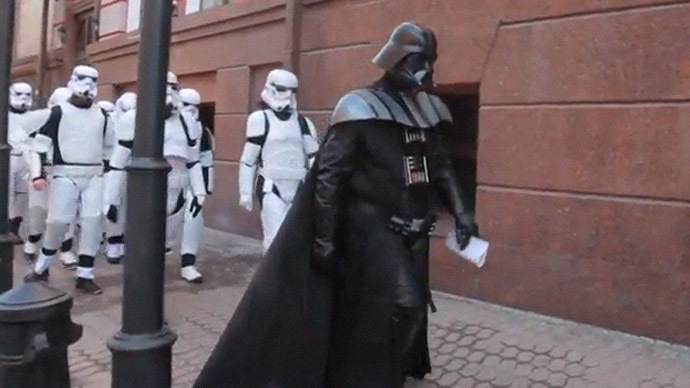 Last Tuesday, people disguised as Star Wars anti-heroes attempted an assault on the Ukrainian Ministry of Justice in Kiev, demanding a review of the recent decision to abolish the Internet Party. The news posted at the party’s website says the raid was carried out by a group of unidentified people. However the party’s Darth Vader confirms the event was initiated by him at a personal page on the Vkontakte (In Contact) social network.